Updated June 18 at 12:30 p.m. The Larchmont Chronicle searched its archives for a history of the just-sold home of Antonio Banderas and Melanie Griffith on Muirfield Road. The recent sale for $15.9 million is a record-breaker for the Hancock Park area. 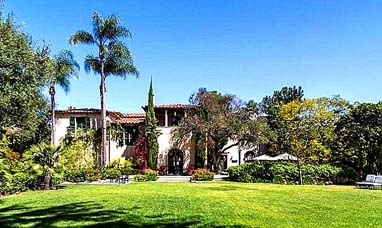 The 15,000 square foot residence commissioned in 1925 by Isidor Eisner sits on 1.5 acres at a cost of $430,000. BANDERAS-GRIFFITH home sold for $15.9 million. The Mediterranean style home is built around an inner courtyard with a swimming pool. The halls and library are wood-paneled and the two-story banquet hall has a musician’s gallery. The house was sold to Col. Ira Copley, publisher of the San Diego Union newspaper in 1939. It was purchased in 1972 by Dr. Jim Miller, his wife Valerie and three daughters for $175,000. Previous owners had been the Shell family. Joe Shell was a former California Assemblyman. Next owners, in 1993, were designer John Cottrell and his partner John Nelson who paid $1.3 million. In 1996, the house was purchased by French filmmaker Jean Cazes for $3 million. According to Cottrell, the home was used as a speakeasy during Prohibition. Celebrants would arrive by limousine at the separate ballroom entrance and proceed to a secret basement wine cellar.